The first time we had Nepalese food, we were in Boulder, Colorado, one of my favorite places to visit. We were staying in Denver and drove up to Boulder to dine at a little two story restaurant called Nepal Cuisine. We were in a state of euphoria when we left. The food and service was something to remember. When November rolled around for our monthly dinner night, it was our turn to cook. 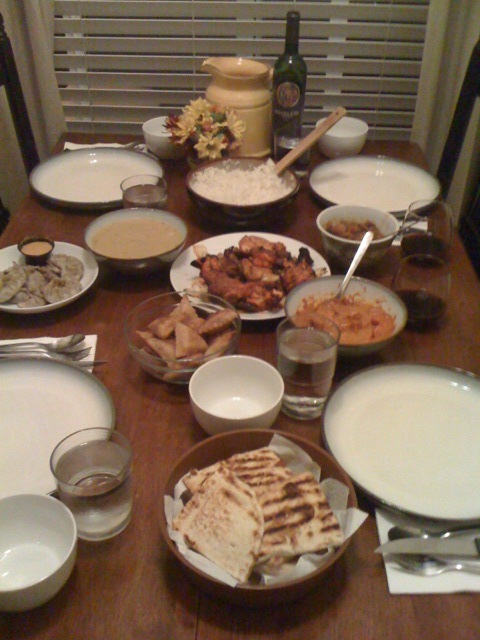 Nepalese food proved to be one of the most difficult dinners for us to carry out so we did just that – ordered carry out! Recipes online were hard to find so we broke the rules for November and ordered Nepalese food from a restaurant in La Mesa, CA. To find the place, I did what I always do and searched Yelp. That’s where I found a lovely little restaurant called Himalayan Cuisine, and my fellow Yelpers gave the restaurant 4.5 stars. We ordered food that can be found on their menu and also added a few items of our own. Alu Bhanta – Eggplant & potatoes cooked in Himalayan style curry sauce. Vegetables Momo – Steamed dumplings filled with minced cabbage, spinach, mushroom, cashew nuts, paneer, onion, cilantro, green onion & spices, served with special Himalayan sauce. Chicken Makhani – Premium chicken cooked in the tandoor and then cooked in a butter sauce. Mixed Tandoori – Tandoor chicken, Boti Kabab (lamb), shrimp tandoor and chicken tikka. Served with sautéed onions, carrots, bell pepper and cabbage.